From left: Water Safety Council FIJI representatives Godfrey Eaton, director John Philp, Kathryn Murray and Fiji Police Force pathologist Dr James Kalougivaki. Fiji Police Force pathologist Dr James Kalougivaki led discussions on the need to collectively plan and develop a national drowning prevention plan. Water Safety Council FIJI (WSCF), was awarded the best abstract titled, ‘Fiji: Review of the Drowning Cases from May 2012 – April 2015,’ at the World Conference on Drowning Prevention in Penang, Malaysia. There were 65 participating countries and over 200 presentations were delivered. 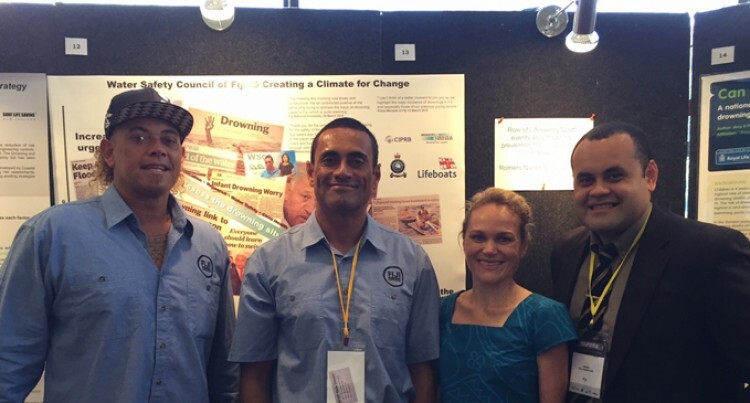 WSCF presentation focused on key findings from the extensive and collaborative study carried though by the Water Safety Council FIJI (WSCF) from May 2012 to April 2015. “If we promote the issue of drowning in Fiji at this type of international platform it enables us to find partnerships, and share with others in the journey of finding solutions” WSCF director John Philp said. The World Health Organisation (WHO) funded Dr Kalougivaki’s trip to attend the conference. Dr Kalougivaki took the stage during the closing plenary and led the discussions on the need to collectively, plan, develop, pilot and implement a national drowning prevention plan. To further demonstrate the implementation of the tightly focused quality assured research project, the WSCF worked closely with Police force, Fiji Meteorological Services and Fiji’s Ministry of Health and Medical Services. The core findings indicated that the majority of the drownings occurred during the cyclone seasons with drownings increasing year by year since 2012. The research focused on illustrating who is drowning against geographical influences, demographics and primary contributing factors such as time of year and core activity being undertaken by each victim. Evidently, the findings encouraged the need for ongoing collaboration and research to develop, implement and imbed tailored strategies into core educational, disaster management and drowning deterrent programmes. This is to prevent one of the leading causes of unintentional injury death – drowning as stated by the World Health Organisation in 2014.